Dear restaurant owners: Let us eat cake! Wait, strike that. It’d be diet murder. 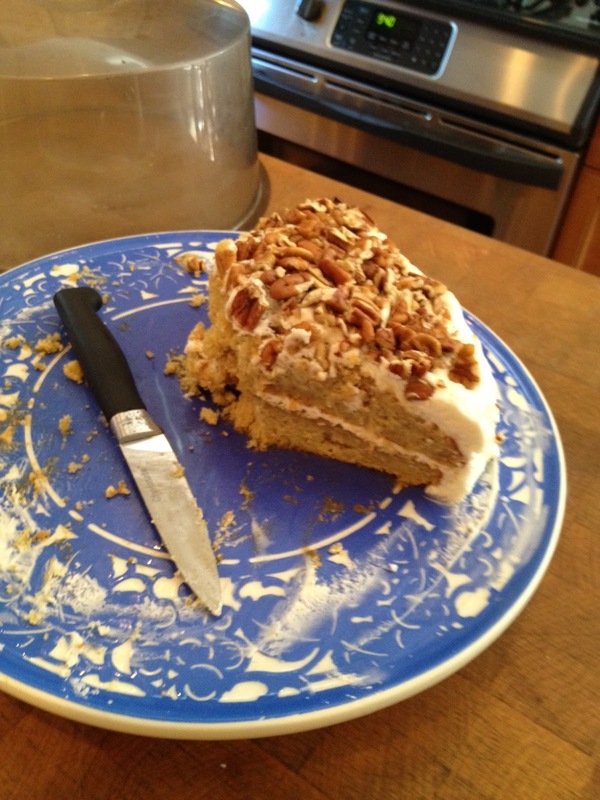 Hummingbird cake leftovers. For now anyway. The truth is somewhere in between. I’ve mentioned in posts sometimes when I’ve chucked my Weight Watchers points and eaten, say, a wonderful tartufo covered in a shell of rich, dark chocolate at Cafe Fiorello in New York City. But it’s also true that those diet indiscretions garner far less ink on The Restaurant Dieter than the low fat, healthy eating to which I aspire. It’s also true that I rarely order desert at a restaurant, but it’s not totally because of The Restaurant Dieter. It’s because the desserts at most restaurants are flat out boring. But cake — those glorious ones turned out by legions of women for church suppers in the South — have disappeared almost completely from restaurant menus. I’m talking about the kind of cake that graces the pages of Rose Levy Beranbaum’s “The Cake Bible” or Ann Byrn’s “The Cake Mix Doctor.” A golden cake with fresh strawberry slices and whipped cream. A red velvet cake with cream cheese frosting. A coconut cake or dense, flourless walnut torte like the kind my mom used to make for my birthday. Cake lovers have had to make do with the cupcake trend, but that’s rarely at a restaurant that serves more than sandwiches and luncheon food. This weekend, The Restaurant Dieter was invited to dinner at a friend’s house. A couple of bananas were siting on the counter and the temptation for a really good piece of cake proved too much. We had to bring something, I rationalized. Heading out (to Weight Watchers, no less!) I left the “The Cake Mix Doctor” on the kitchen counter, with a post it note pointing out that the Hummingbird cake with cream cheese frosting used a couple of ripe bananas. The Restaurant Dieter’s spouse is a whiz with cakes and enjoys making them. At dinner last night, we finished half of the cake. The friend — also watching her points — kept a piece and sent us home. The Restaurant Dieter’s spouse had a piece this morning as a second course to an omelet. “It’s basically banana bread with a little icing,” he rationalized. For the record, The Restaurant Dieter himself hasn’t had any today. Yet.